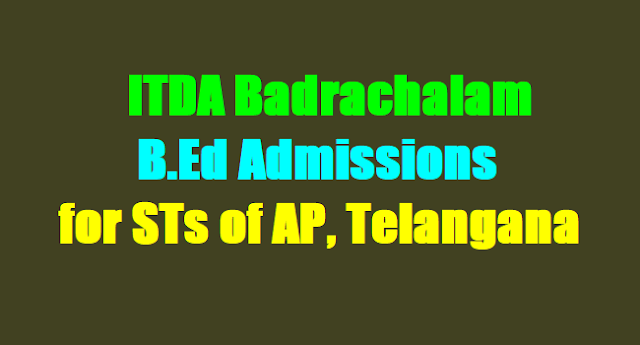 TS/Telangana AP ITDA B.Ed Admissions, badrachalam tribal b.ed colleges admissions, application forms, last date for apply, selection procedure, selection list/results, how to apply and list of documents details given here. College of Teacher Education(Tribal Welfare), Bhadrachalam, Khammam District, Telangana State(Managed by I.T.D.A. Bhadrachalam) has given the B.Ed Admission 2017-2019 notification and applications are invited from the eligible candidates for admission into two year B.Ed Course. 2. The Scheduled Area Tribal candidates who have passed B.A/B.Sc./B.Sc(Home Science)/B.Com/B.C.A./B.B.M. examinations held in April/May 2017 or prior to it are only eligible for admission in to the course. Candidates should have secured 40% of marks in the qualifying examination. 3. As per GO.Ms.No.92, the candidates who passed B.E/B.Tech, M.B.B.S/B.D.S /B.A.M.S/B.L./L.L.B/B.A(Languages)/B.O.L etc., and such professional courses are not eligible for admission into B.Ed course. The candidates should have completed the age of 19 years on 1st July of 2017. Latest rules of admissions prescribed by Government of TS, Ed. CET. 2017 Committee and Kakatiya University will be applicable. All the In-service candidates have to pay the fee prescribed by the Government. There will be no fee for the fresher who are under income limit. The college is not having any hostel facility. Scholarship will be given as per norms. Selection and ranking as follows: Selection will be made on the basis of marks obtained in Part-II of the Degree examination PURELY ON ORDER OF MERIT AS PER NORMS INFORCE. Where there is a tie in Part II, marks in Part-I will be taken into account to decide relative ranking. In case of further tie, age shall be taken into consideration for relative ranking and older candidate shall be given priority. 1. O/o. The Project Officer, ITDA, Bhadrachalam, Khammam Dist. 2. O/o. The Project Officer, ITDA, Utnoor, Adilabad Dist. 3. O/o. The Project Officer, ITDA, Eturunagaram, Warangal Dist. 4. The College of Teacher Education (TW), Bhadrachalam, Khammam District. 1. Incomplete applications submitted without necessary documents will be rejected. 2. All original certificates are to be submitted at the time of Counselling/Interview only.They will be returned only after the completion of the course. No extra time will be given for submission of certificates after the date of interview. 5. Intimation letters will be sent to the provisionally selected candidates by Post. The college is not responsible for any postal delay. 6. Merit list will be displayed on the College notice board. 7. Provisional selection will be cancelled if any candidate fails to produce all reliable documents and to pay complete fee at the time of counselling. The vacant seat due to cancellation will be filled in by the next candidate from the waiting list on order of merit . Enclose attested Xerox copies of the following certificates in the order mentioned below. 1. Study Certificates from 9th to Degree (in case of regular study). 4. Degree Three years Mark Memos(Consolidated Memo). 8. Integrated Caste Certificate issued by TAHSILDAR. 9. Scheduled area Certificate issued by TAHSILDAR ESSENTIALLY REQUIRED NOT BY THE OTHER OFFICIALS. 11. Certificate from concerned authorities (in case of Spl - category). 12. No objection certificate (in case of in-service candidates). 13. Migration Certificate in case of the candidate if graduated from Universities other than Kakatiya University. Note: The application will not be considered if any of the above required certificates is not enclosed and criminal case will be initiated in case of submitting fake certificates. All the original certificates should be submitted at the time of counselling / interview. They will be returned after the completion of the course. No extra time will be given for the submission of certificates after the counselling/interview day.